Data can be like that too. We can be drowning in an ocean of data without ever finding a drop of real information. Some of you may recall one of my blogs last month, “In the Computer’s Cheap Glow,” which reflected on iPass SmartConnect™ and the hierarchy that starts with raw data and ends with knowledge – knowledge that hopefully precipitates action and maybe increases revenue, or even generates new revenue streams. 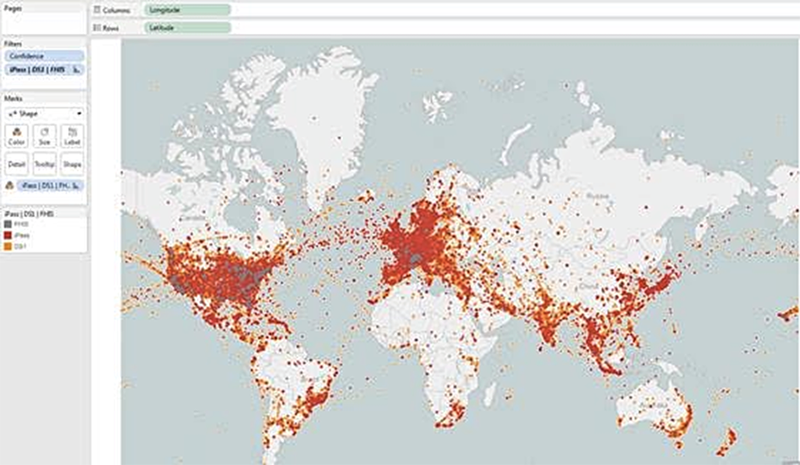 The red dots represent Wi-Fi hotspots – about 40M so far – and growing. And you may ask, “How can there be hotspots in the ocean?” Well, it’s not the Ancient Mariner, but is, of course, in-flight Wi-Fi: Gogo, Panasonic, Viasat, and others, all in airplanes cruising around the world. Now, this data isn’t pure yet – we’ve got some filtering to do, including taking out devices that may have an SSID (like printers), and smartphones with personal hotspots, etc. Regardless, we’re getting a pretty good picture for how the global Wi-Fi map is shaping up, all in just a few weeks with a few thousand devices. And this data has already started helping our customers and helping grow our business. As an example, at the conference I mentioned, I offered this use case: one of our partners asked if we could expand our Wi-Fi footprint in Singapore. 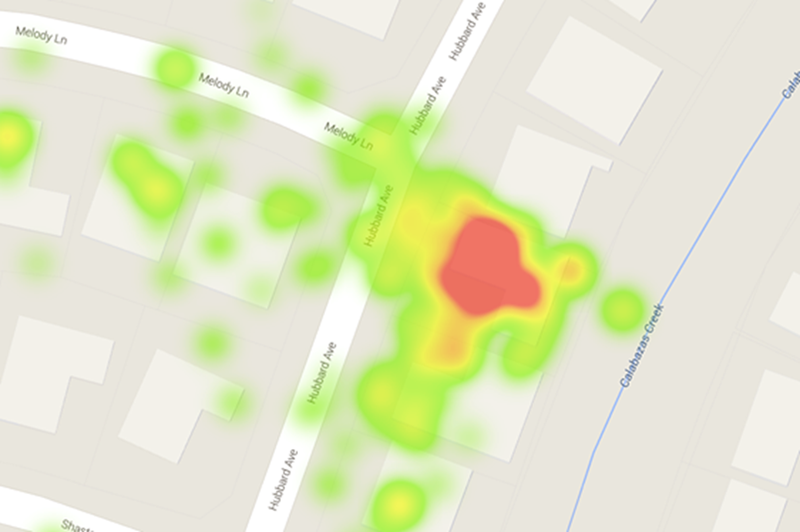 So we drilled down in the map above, and produced a hot spot map of Singapore, shown here. The orange dots are hotspots currently in our network, the blue are not. We were delighted to see that our data proved that we have almost the exact number of Wi-Fi hot spots that we thought we had in Singapore, based on our network supplier partnerships in this country. And, of course, iPass SmartConnect also discovered thousands of hotspots that are not part of our network, at least not yet. But going back to the notion of curating hot spots, we see that we can potentially more than triple the size of our footprint in Singapore simply by curating those hotspots that are free, available, and reliable (based on our standards). Also, we are able to identify, in rank order, the commercial Wi-Fi networks that are not currently part of iPass. Once correlated with traffic patterns we are collecting, this data will help us create a prioritized listing of networks for our supplier team to contact in order to develop new commercial relationships. The result: further expanding our network—with intelligence. But supplying hotspot locations and delivering network growth are not the only benefits our new data is providing. The following graphic plots success rates by location: green = success, red = connection failure. This kind of information is invaluable in assessing reliability and improving QoS. As we identify hotspots with chronically high failure rates, for example, we can “blacklist” them. That is, we remove them from the network and route traffic to better-performing access points. There is much more we can glean from the signal strength and connection data, but we’ll be spending more time in the future discussing the details as we progress down these exciting new paths. This is the same data that we see in the global map, but magnified to show signal strength with granularity at the city block level. Imagine the possibilities. And we will – but that is for another blog.